Winterground Fairlands - A World Of Funmagineering! : More Laserdisc Stuff! A wild Pioneer CLD-V2400 appears! More Laserdisc Stuff! A wild Pioneer CLD-V2400 appears! I just picked up this Pioneer CLD-V2400 in full working order, and in excellent condition. It was made in 1993, around the same vintage as my Pioneer CLD-S201... but with one major difference... a SERIAL PORT! This thing has a DB-15 connector On the back for the RS-232 serial interface, which includes TTL Serial (0-5v) and RS-232 serial (+/- 12v). 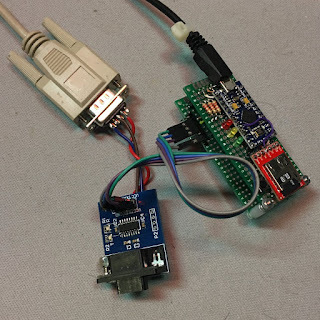 Since I couldn't find my USB-Serial interface, I tried making a TTL cable, and connecting that via FTDI cable to my Mac... I wasn't able to get it to reliably work. 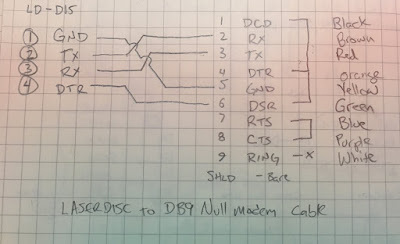 I think it might be a that the FTDI/Mac combo couldn't do the 4800 baud rate or something. 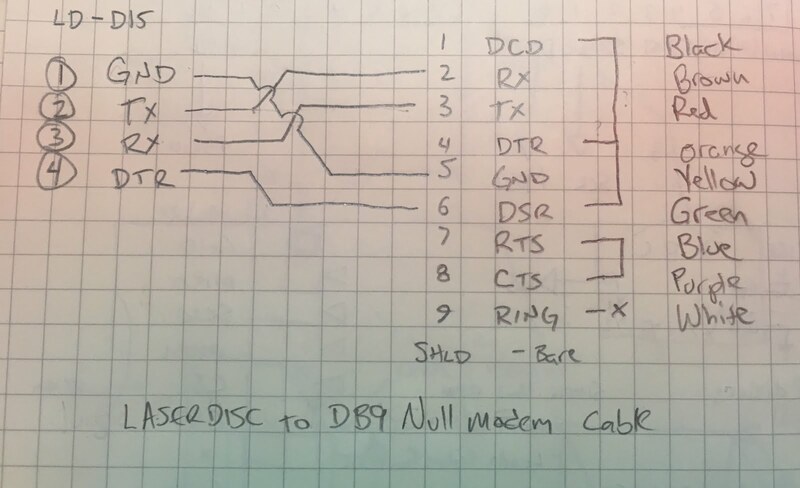 Instead I made a DB15-DB9 Null modem cable, and decided to plug it into the 9 pin serial port on... something? I had a hard time finding any of my machines with DB9 serial, but eventually remembered that my tiny Toshiba Libretto 50 has one! So yeah! Windows 98 and HyperTerminal it is... and it worked great! Next, I went through the V2400/V2600 manual, (and the V4400 manual) to figure out some commands that I could do. I had some experiments I wanted to do with using the "user area" of the on screen text of the player. First of all, I wanted to see how to do it.. which you can see in this pic. I had my CAV Duran Duran disc playing, obviously. My thought is that I can do thing similar to the "Rollercoaster" project and just command the thing to play scenes, but it can be taken a step further. Another option available is to get a user number press from the remote. The user presses 0..9 and you get that back through the serial port. It would be possible to make a modern game or interactive video thing using onscreen text for the output, and remote for the input. The display area on this player is 10 lines of 20 characters each. Not a lot, but enough for activities. Perhaps I could encapsulate the game and logic inside of an Arduino would work... but that still brings up the TTL serial issue. I scoured my basement, looking for my Belkin USB-Serial dongle, which I'm starting to believe I never actually had... I eventually gave up and decided to kludge together this monstrosity. The nice serial cable I made was a null-modem cable, but the serial level interface (blue board) had the wrong gender and pins for my use, so i tacked on some wires to the correct connector. The Arduino is a Pro Micro (ATmega 32u4/"Leonardo") made for another project. so it already had the microSD socket and external FTDI connector for a serial peripheral, so this went together substantially quicker than looking for the USB interface. Regardless, this somehow worked... really well. I needed to make a simple Arduino program that just reads in from "Serial" port, the USB side of the Leonardo and writes to the "Serial1" port, which is on pins D0 and D1. The trick was to have both open at 4800 baud. I had the LD side at 4800 baud, and the USB side at 115200, but that didn't work. I've made it so I can type on my mac, and control the player... or have the Arduino autonomously control the player. I think I need to make a script that seeks to the end of the disc to get the duration, then randomly seeks around, plays a second or two, and then repeats that... Especially with squelch off!